As simple a story and concept as it is, Once has become something of a phenomenon. A small indie move from 2006 quickly developed a following, and the film’s haunting ballad “Falling Slowly” won the Oscar for best song. Still, as surprisingly successful as it was, I doubt many people would have predicted it would become a stage musical, or that the musical would become a critically acclaimed hit that would win the Tony for Best Musical in 2012 and lead to a successful production in London’s West End and, now, a National Tour. It’s kind of like “The Little Show That Could”. I think the reason for its success, as the excellent National Tour production currently running at the Fox Theatre exemplifies, is that it’s never tried to be anything more than it is–a simple, sweet, expertly crafted story with a basic concept that emphasizes the characters and the lovely music that they make. The story here, based on the film starring songwriters Glen Hansard and Marketa Irglova, is not flashy or overly produced. Against the simple backdrop of a bar in Dublin, Ireland, we are told the story of a nameless busker referred to in the credits as Guy (Stuart Ward) who is ready to give up his dreams of a career in music until a fateful meeting with a young Czech bystander known only as Girl (Dani De Waal), who is impressed by Guy’s music and encourages him not to give up. The whole story takes place over about a week, in which Girl helps Guy assemble a band from an unlikely mixture of characters–a belligerent music shop owner (Evan Harrington), a music-loving banker (Benjamin Magnuson), and two of Girl’s Czech housemates (Matt DeAngelis, Alex Nee). Girl meets Guy’s father (Raymond Bokhour) and Guy meets Girl’s mother (Donna Garner) and daughter (Kolette Tetlow). A strong friendship and “will they or won’t they” mutual attraction grows (despite personal complications) as they work together to record a demo of Guy’s songs that they hope will be the key to a successful musical career. Although it’s a fairly basic story and a lot of the elements are somewhat predictable, it’s still a mesmerizing story because of the extremely well thought-out concept and well-played characters. This is a brilliant example of a “concept show” in which the concept doesn’t detract from the characterization. In a big way, the characters are the concept, in that the structure of the show and the simple set and format allows for the main focus to be on the characters and their story. Also, the staging contributes to the overall musical atmosphere to the point that the music becomes a character itself. The songs are glorious, all accompanied onstage by the actors themselves on various instruments from piano to guiatars, drums, mandolin, violins, cello and more. 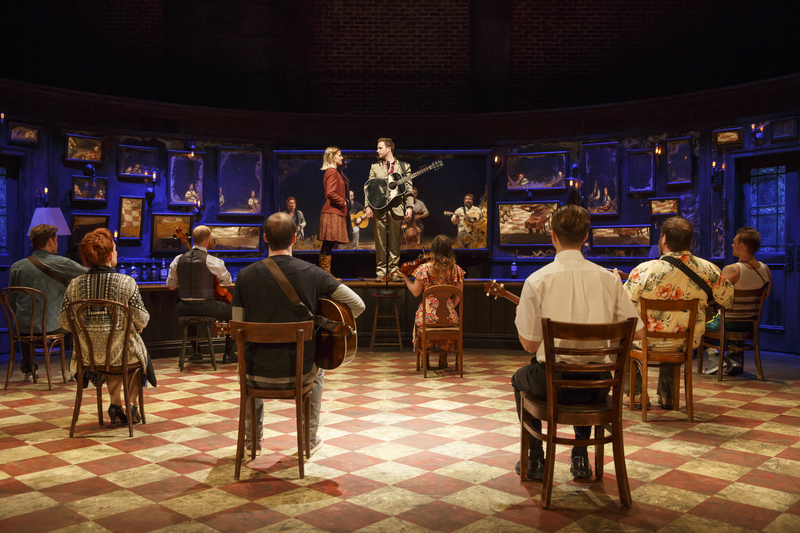 The music is such a big part of the show that it even begins before the show does, on the authentically-appointed bar set (designed by Bob Crowley, who also designed the great costumes). Several of the players are onstage playing traditional folk tunes before the story officially starts and (in a nice interactive twist) the audience members have been invited onstage to buy drinks. After a little while, when Guy first appears onstage to sing the anguished “Leave” it almost seems like it’s happening in “real life” (and the house lights don’t go down until halfway through the song). Then he ends his song with Girl just standing there, having quietly entered from the audience, and the story gets going from there. The staging is like that throughout–simple and with an entirely organic feel, with the actors moving the set pieces on and off with elegant, dance-like moves, and simple sitting down at the sides of the stage to play their instruments during many of the musical numbers. Credit goes to original director John Tiffany and movement director Steven Hoggett for their creative use of staging and movement that contributes to the telling of the story. I also found the clever use of Czech subtitles (projected on a screen above the bar) to indicate when characters were speaking Czech (although the actors are actually speaking in English), except for one very key scene in which an actors speaks Czech that is subtitled in English. I’m truly amazed by the beauty and simplicity of it all. Not one foot is put wrong in the concept and staging, and everything serves the story perfectly. It’s a great concept, and it’s all executed remarkably well. Performance-wise, the show centers primarily on its two ideally suited leads. Both Ward and De Waal bring charm, stage presence and likability to their characters, and their chemistry together is wonderful. The attraction between them is obvious, and they make the audience care about their relationship from the first time they meet. 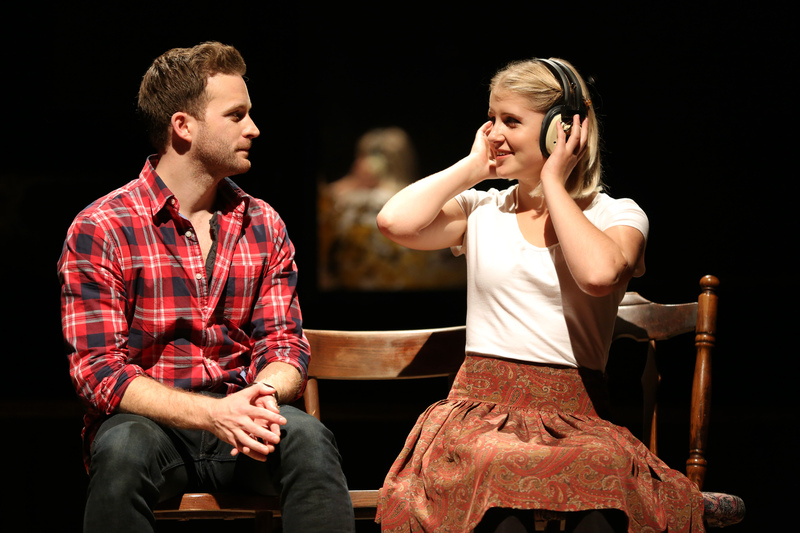 Ward is able to communicate Guy’s disappointment, anguish and melancholy at the beginning of the show as well as convincingly portray his journey toward hope, spurred on by De Waal’s spunky, determined Girl. They also harmonize beautifully on all their duets, and particularly on the show’s most well-known song, “Falling Slowly”. Each is also given some great solo moments, with Ward’s strong, emotional delivery showcased well in “Leave” and “Sleeping” and De Waal shining with “If You Want Me” and “The Hill”. The supporting players are exellent as well, most notably Harrington as the overbearing but still likable shopkeeper Billy, and Magnuson as the overly eager bank manager. It’s a very well-balanced cast all around, with no weak links, and everyone sounds great, both vocally and intrumentally. I especially liked the ensemble work on the two very different arrangements of “Gold”–sung as a driving anthem in the first act and as a haunting a capella ballad in the second. I can’t say enough how impressed I am by this show. I had never seen the film before, although I had heard much about this musical and I had been eager to see it. The anticipation was definitely worth it. I find myself continually amazed at how well this very simple little story could be told with such big emotion, beautiful visual and rich musicality. It’s a classic “boy meets girl” story with a few small twists along the way, with their real love story not only being with each other, but with their city, their friends and families and ultimately, their music. It’s a great show, and I highly recommend checking it out.